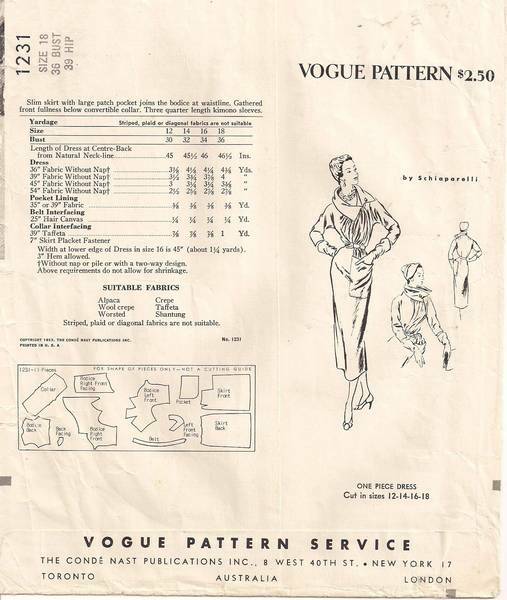 Very rare Schiaparelli Vogue 50's dress pattern. 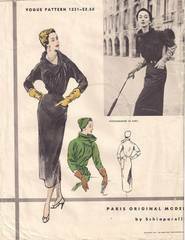 One piece dress with dramatic collar and bodice construction. Size 18; Bust 36; Waist 30; Hip 39. Pattern is used and complete. Archival tissue tape mends on several of the pattern pieces. Instruction page is complete; beginning to wear/split on one fold line. Envelope is complete; light/average age toning. Several short splits on the right edge; storage wrinkling. There is a faint and narrow half-circle stain from a beverage glass or mug on the envelope front.